Although some species are found in other islands of the pacific the Coprosma family has made a home here in New Zealand. There are a wide variety of Coprosma species and an even greater number of hybrid cultivars. 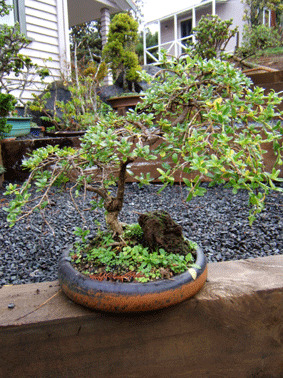 Most of which are very good for bonsai. The mirror plant has a very unfortunate and undeserved botanical name. Coprosma is derived from the Latin Kopros-dung and Osme-which means smell. This name can be attributed to one particular species and none of the currently cultivated species has the misfortune of continuing on this trait. The Coprosma family range in size from low ground cover plants to medium sized shrubs. They grow over much of New Zealand and will tolerate a wide variety of conditions, even salt spray. Coprosma are very hardy plants and will tolerate almost any conditions, they respond well to clipping and have a good fibrous root system. 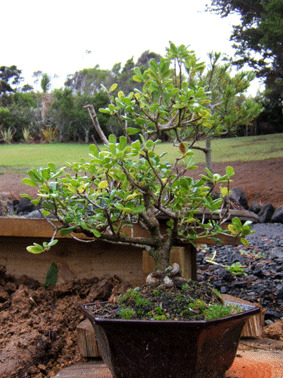 This makes them an ideal plant for the novice bonsai artist to hone their skills on. Almost all the varieties respond well to bonsai, I tend to leave the more heavily variegated varieties. Variegation is difficult to get looking right in bonsai and quite often just makes your plant look sick. Normal bonsai soil mix is fine for Coprosma, but keep them well watered in summer and a regular feeding regime will maintain vitality. This is a ground cove plant with dark green leaves. It grows very quickly and can be trained or trimmed to a pleasing shape very quickly. This is a compact foliage shrub with dark green foliage with rich copper colourings. This is the native green variety which is very good as a bonsai. Have a look in your local Nursery or near by bush block coprosma are plentiful and relatively inexpensive. They are easy to transplant which also makes them great as a collected tree. Coprosma are very hardy plants and as long as they are not subjected to undue stress they are not susceptible to any pest or disease in particular. Like any plant especially bonsai if you allow them to become weakened or stressed you may be allowing easy access to infection. Keep you work and staging areas clean, remove any dead or diseased plant material and keep your plants fed and unstressed and you should eliminate the majority of potential problems.